These pretty little lizards were the fastest-moving thing on the ground in the Florida sandhills. I saw them every day, but I never managed to get a photo of one in situ. I caught this one in a snake trap and snapped this shot just before letting it go. Look at those crazy long toes! The six-lined racerunner is a type of whiptail lizard, the only one found in the east. There are more in the southwest. You might have heard of those; they’re known for a very interesting trait. Some populations of whiptail lizards are all female. They reproduce by parthenogenesis. No males required! This is not the same thing as the asexual reproduction you see in plants, where a part of an organism is broken off and an entirely new one grows from it. That’s cloning, in which the offspring and the parent have the same set of chromosomes. In parthenogenesis, no new DNA is introduced, but the existing chromosomes still go through meiosis, so the offspring are not genetically identical to the parent. And, honestly, my several attempts at a paragraph explaining how that works only reminded me that it’s been a long time since I took a genetics class, so I’ll do us all a favor and just point you to Wikipedia’s entry on parthenogenesis. We tend to think of only plants and some invertebrates as reproducing asexually, but it’s more common in vertebrates than you might have thought. Some of the other species it’s been documented in include hammerhead sharks, boa constrictors, Komodo dragons, and domestic turkeys. While looking for examples, I discovered that I’m already familiar with some local snakes capable of parthenogenesis: the cottonmouth and copperhead — a 2012 study found genetic evidence in both species! 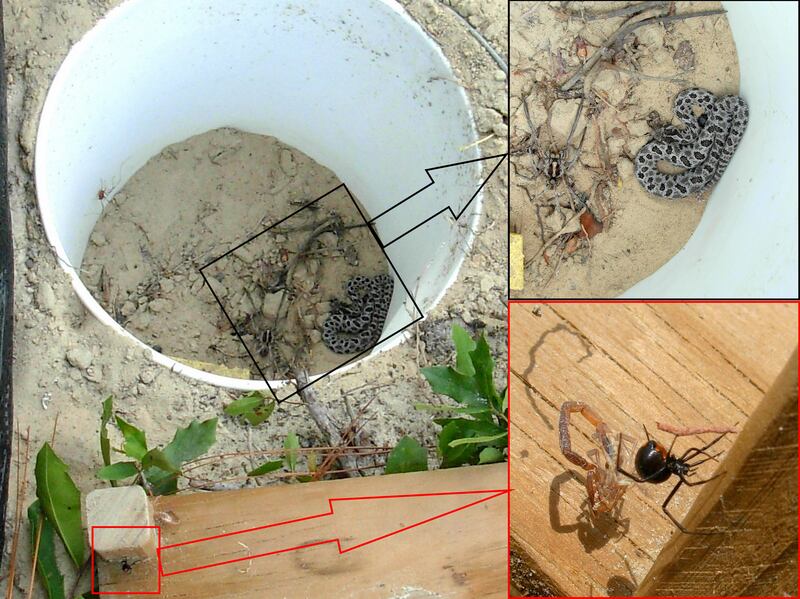 No matter how you feel about venomous snakes, that is pretty damned cool. Rat snakes are some of the most frequently seen snakes in the US, but they still cause a lot of confusion and panic. They’re often mistaken for whatever venomous snake lives in the same area. They’re relatively large snakes, and they have an intimidating defensive posture, raising the fronts of their bodies above the ground. And they can have a slightly triangular head if you’re looking at it and thinking, is that triangular? I don’t know… maybe? Kinda. Better assume it’s venomous. They’re also skilled tree-climbers*. If you live in the United States, and you see a snake hanging out in a tree in your yard, or from the rafters in a barn, or perched calmly on top of your doorframe as you go to open the door, chances are pretty good that you have a rat snake. These are all the same species! At the edges of their regions, intergrade patterns are often found. The Atlantic coast has some olive-green ones, a mix of yellow and black. In the Piedmont, where I live, they’re mostly black but often have some faint markings. Rat snakes are constrictors, like boas and pythons, but much smaller. A truly giant rat snake is about 7 feet long, and most adults are under 5 feet. Still, you could say they’re the closest thing the US has to pythons (except in the Everglades, where the Burmese python has become a pest). They like abandoned buildings and other structures near humans, where the rats are plentiful. So if you see a big yellow, black, or brown snake hanging out in a tree or a hayloft, no need to panic. It’s probably just a rat snake going about its exterminator duties. Leave it alone, and enjoy fewer rats around your house. How does a limbless animal climb a tree? By using its belly scales to push against the rough bark. 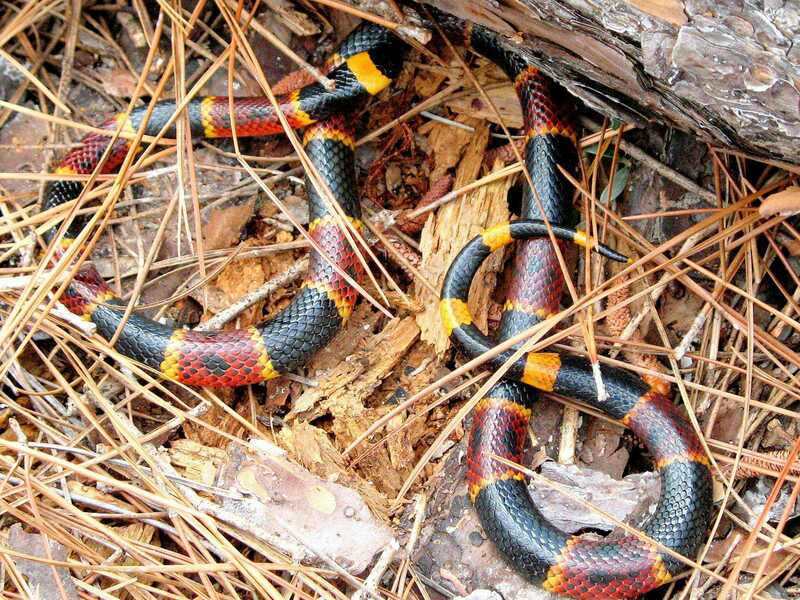 Whether grubbing around in my flowerbeds or wandering through the woods, the snake I encounter most often is the Northern Red-Bellied Snake. Although my trusty Audubon guide states that these snakes range from 8 to 16 inches in length, most of those that I find are on the smaller end of that range. 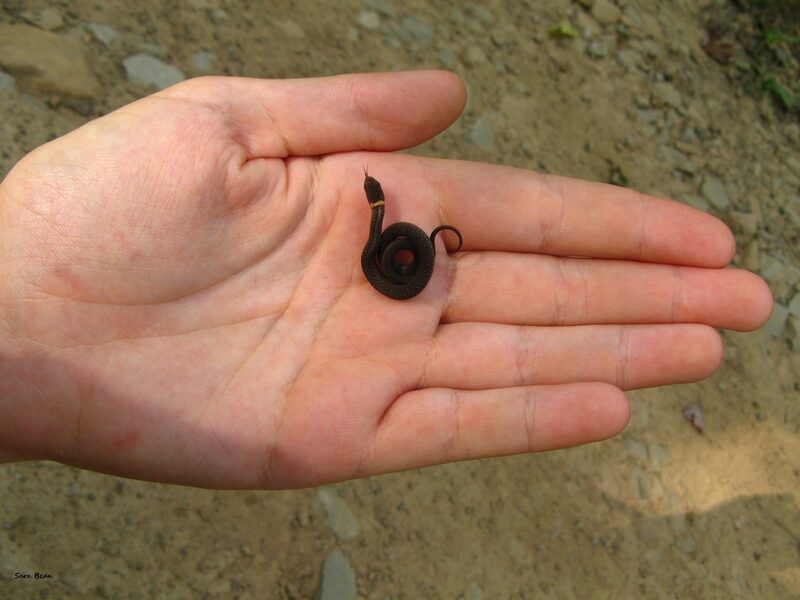 When born (via live birth), these little critters measure just 3 to 4 inches long. As the name suggests, Northern Red-Bellies (henceforth referred to as NRBs) typically have vivid red bellies — with an occasional yellow or grey-bellied snake thrown into the mix to confuse matters. The dorsal side of their bodies can range widely in color from red-brown to dark grey, either plain or with one to five dark stripes. Their heads are typically dark, with three pale yellow-brown spots on the back of the neck. Sometimes the spots fuse to form a collar or ring, causing some amateur herpetologists confuse NRBs with the more common Ringneck snake. NRBs prey on garden pests like slugs (gardeners rejoice!) as well as earthworms and other small invertebrates. They are benign and easily handled, seldom displaying any signs of alarm or distress when picked up. If they do feel threatened they’ll curl their upper lip in what looks suspiciously like a sneer of disdain, or assume a pose that makes them look like a very tiny adder. 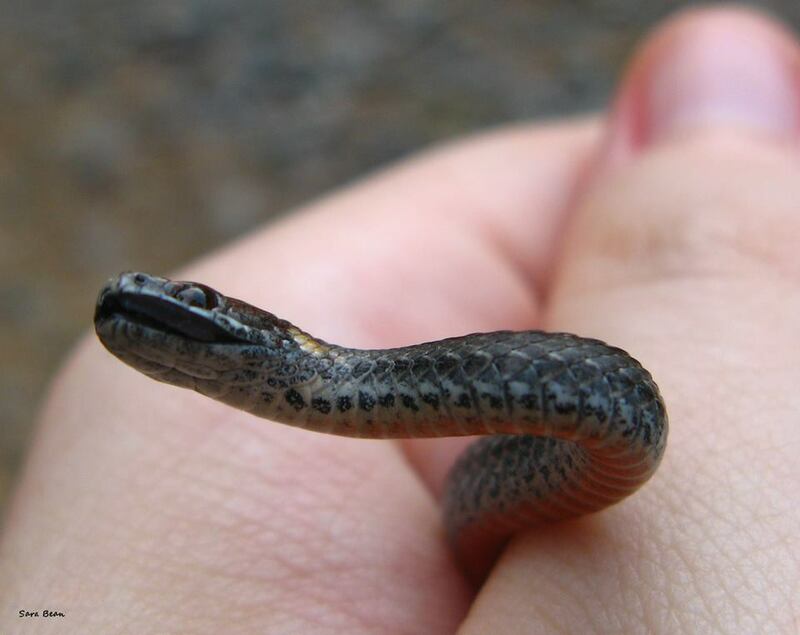 As they’re so tiny and cute, this display is not very convincing to snake enthusiasts. Luckily it does work on some predators, as a wide variety of wildlife from shrews to raccoons to birds of prey find NRBs quite tasty.